Hey everyone. Sorry this is going to be really short. I have tons of school work to catch up on since I've been home and dying. (Joke! Not literally dying). Unfortuantely, I am not really feeling better. I went to see my doctor Monday and was told that I have a respiratory "bug" and it's bothering my asthma that's been dormant for about 10 years or so now. I was given an inhaler (I felt stupid because I sat at home trying to remember if I was doing it the correct way. It's been a while). I'm not so sure if it's actually working or not yet. I still have this really harsh cough and bad chest pain. I've coughed my throat raw and now my ear hurts. Thank God the headache is nearly gone though. I hope everyone else is doing great. Last edited by BlueStarEgo on Wed Mar 23, 2011 1:35 am, edited 1 time in total. Hello ladies! Hope all of you are well. We spent a wonderful few days in the mountains, staying in a chalet with another family with kiddos close to our kids' age. We relaxed, hiked, had picnic lunches, played games, played outside, ate too much, drank a wee bit too much adult beverages one night , etc. The kids had a blast playing pool and shuffleboard in the house we rented, and playing these really old stand-up video games that were probably from the 70's or early 80's, we think. The graphics were terrible, but the kids were amazed to see something completely different from the Wii. I missed you ladies; and as always, it's great to check back into the Halfway House. I always feel like I'm missing a part of myself when I'm away from here for a few days. Missp~ I'm happy to hear your Dad enjoyed his birthday. I'm glad to hear he's doing well, and I'd wondered how he's been since his accident last year. Hope you enjoyed your shopping, and the lovely weather you've been having. Now I'm kind of mad that I gave up on American Idol, after hearing you say how great it is this year. I always thought Paula was pretty terrible as a judge; and as much as Simon irritated me, I just couldn't imagine the show without him. I'm glad to to hear the singing talent is more impressive this season. Not to be offensive or disrespectful to anyone, but I thought last year's talent was at an all-time low, overall. Good luck with the achievement testing this week. Is that the same thing as our TCAP tests in Tennessee? I hope we can work out a WFE viewing together. My daughter will be playing basketball tournaments nearly every weekend for the forseeable future, but I think she'll be finished by mid-May. Caryn~ Hope you're well; we've missed your megaposts the past couple of days. Congrats to your Bulldogs! I think the best clip I've seen is the one of Coach Stevens chest butting one of his players after the game. That picture is a highlight, and will definitely be played during "One Shining Moment" after the finals. Loved this pic you posted Caryn! Once I stopped staring at Alice's lovely hair and make-up, I realized how perfectly Rob's silky smooth shirt (and trousers) clung to his body. Penny~ Thanks for letting us know about the MTV award nominations, and always keeping us up to date and "in the know". I'm assuming that the proposal scene kiss is the one nominated, or is it one of the meadow kisses? Ann Marie~ Your Mom is lucky to have you, and you're very special to move in to help care for her. Chrissy~ We're glad to hear you had a good birthday and visit. Hope you're over your cold soon and I'm sorry about all the discomfort with your cough. Good luck catching up with your schoolwork. Susie~ Sorry about Sonny Boy's monopolization (is that a word?) of your computer for his classwork. I remember you telling Missp and me about his online health class. I'm sorry it cramps your style, but at least March 30th will be here before you know it. Are you really at Lulu's yet? I was somewhat suspicious of your recent plans myself, just like Jaclyn. I suppose it's because you kept prepping us for a possible out-of-town trip for SonnyBoy's spring break. If you are visiting, I hope you have a great time. I love that you've converted your friend Maureen to an official Twi-hard....and she's even read MS. Our short trip was very relaxing; thanks for asking. Hubs and the kids drove to East TN to visit his parents Thursday night. I had to work Friday, so I rode up to Gatlinburg with our friends Saturday morning, and we met hubs and kids at the chalet Saturday afternoon. And don't you know, even though I had to work Friday....I enjoyed a little quiet time to myself with everyone else out of the house. I stayed up way too late Thursday and Friday nights lexing and reading fanfic. And it was blessedly peaceful. The kids' spring break started last Friday, and they'll head back to school Monday, March 28th. I hope you're having fun with your brackets....and once again, I'd like to apologize for Vandy's performance (or lack thereof). And I'm sorry I couldn't warn you from putting them in your Final Four. 25 out of 32 teams correct in your first round is pretty great.....especially with some of the bracket busters we've had this year. 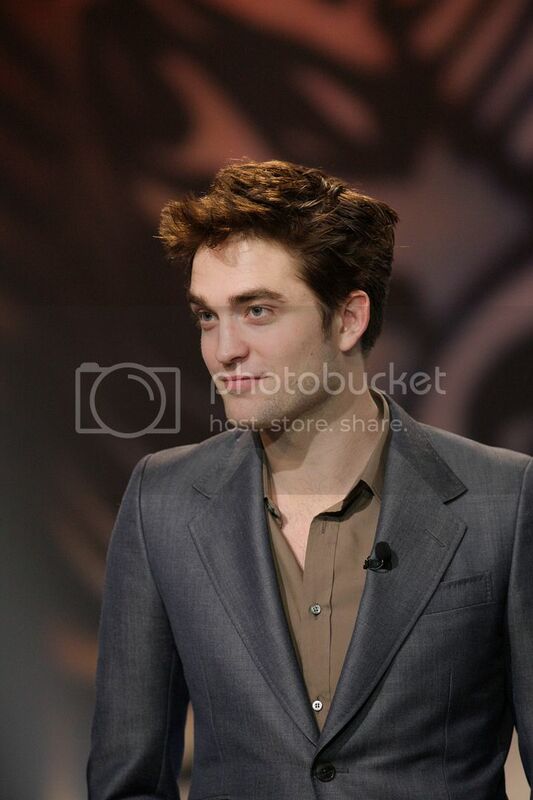 Let's go with grayish-blue, or bluish-gray for Rob's suit on Leno. Jaclyn's ActionRob in purplish heather reminded me of Robward in the meadow too. Jaclyn~ I loved all of ActionRob's photos. Who does all the posing of ActionRob, and who takes all the pictures? It's great that you have your bf's assistance with ActionRob. ActionRob is so incredibly helpful and busy at your house—he may be bored when he visits here. I hope you get the chance to see The King's Speech soon. It's a great movie, but would still be great on a DVD and doesn't have to be seen on the big screen. How is WFE and how far are you in the book? Are you picturing Rob as Jacob? Your dinner with your parents sounded very successful and I'm certainly impressed with the creativity and culinary talents of you and your bf. Jade~ I'm looking forward to seeing KSTew as a “dark” Snow White too—I totally think she can pull it off....Snow White with angst and a kickarse attitude. Marielle~ I'm also sad to hear Unbound Captives may have gone by the wayside. I think that ship has sailed, as Bella would say-- and we've missed our opportunity to see Rob in a loincloth. What's up with your lustful Robdreams, girl, and can you send some of that to middle Tennessee? What is “carting”, by the way? Riding a go-cart? Rob certainly did look very trim on his Leno appearance. What that man does for a nice suit.... is beyond amazing. Lulu~ I'm sorry your friend couldn't get through the first few pages of WFE and give it a chance. I'm with Jaclyn, I'd honestly forgotten those curse words were present so early in the book. I'm not a fan of the written curse word just for the sake of cursing, but I usually get past it if I'm intrigued by the story. Maybe she can try it again someday? I'm sure you and Susie will have a great time when she comes to visit. Congrats on BabyBoy cutting his first tooth....I think you've said you're still breast feeding....just be prepared. Raine~ We're so happy to hear your mother received good news about her health, and I'm sure your entire family is relieved. Thanks for letting us know about the Khar's upcoming EP outtake—I'll have to check it out. I still need to read Alec's outtake. That's great that you've found a fellow Twi-hard relatively close to you and I hope you convince her to visit the Halfway House sometime. I can't think of another movie that I have eagerly anticipated, yet at the same time dreaded its release as much as I have Deathly Hallows Part 2. I can't wait to see the conclusion, but I'm so sad that it's all coming to an end. I'll definitely be ordering the Twilight Saga-Official Illustrated Guide, and the HP Page to Screen book sounds like a keeper as well. Fi and Jenn Jenn~ Hi! I was browsing for news and I read that Rob is on the short list of an other book-movie adept ‘Akira’. I never have heard of it but apparently it’s a 6 part story…have any of you heard about it? Have a nice day, see you tomorrow!!! Water for Elephants - Well you guys were right..I did really love it! I totally seen Rob as Jacob, and Reese as Marlena, but for everything else I have a specific picture in mind (for both other characters & the train, circus etc). I wonder how it will look on the big screen now!! I sorta feel a bit weird about the ending...I guess I won't post too much here in case no one has read it yet (I see that there is a WfE thread!) but just wanted to say [invisible ink] how sad I was when Walter died...I was proper proper heartbroken!! I wanted him to be one of the guys who survived after being redlighted but no And the ending was so unbelievably sweet!! When OldJacob re-joined the circus - wow! Just, wow. [end invisible ink]. So yeah, I too recommend the book if you haven't seen it yet! Raine - Yep I am very excited about the Twilight book!! Yay!! Penny - Thanks for the MTV voting info. I tried to vote, but it wouldn't let me. I'm not sure if it's cos I'm at work just now, or because I live outside the US? I will try again later though! Lulu - Yay for BabyBoy's first tooth!! That's so exciting! Caryn - Hey there Glad you could get caught up! Chrissy - Oh no! Sorry to hear that you are still sick...I really hope it clears up soon! Tracy - Thanks for telling us some details of your trip; it really sounds like you & your kids had a great time!! Like I said to Penny I think that the best kiss for MTV will be between Bella & Edward and Bella & Jacob...and I think that Jake will get a lot of votes, mostly from people who don't like Edward or just don't like Twilight and would love to see Edward lose Nooooo!!! Glad you liked the ActionRob pics! I usually take the picture, and you can see my bf hold him a couple of times Haha! Nah I haven't really done anything exciting with him - I'm sure he will have a blast at your house!! I LOVED WfE. I finished it last night, and spoke a wee bit above about what I thought. I am planning on checking out the WfE thread, but of course I would love to talk about it more with you guys too! Maybe later though cos I'm at work just now LOL. Marielle - Oh no! Sorry your day didn't get off to a good start, but at least it can only get better now!! LOL. I hope your finger & head are ok though! Ahhh. It feels so good to be back to a "normal" schedule. I've missed everyone and keeping up to date. But, here I am now. Chrissy~ I’m right in the same boat with you, darlin’. I’ve had a lot of trouble breathing the last several days and it is irritating my asthma, which I haven’t had any issue with in nigh on a decade. I’ve not seen the doctor yet (I hate going to the doctor) but am considering it to see if an inhaler would help. Good luck on getting all caught up with the schoolwork. Tracy~ I KNOW!!! We knew they would nominate that farce. I’m honestly just glad they didn’t nominate that other disgusting moment because that would just be beyond wrong. Alas, I have a feeling that it is going to come down to, once again, a battle between Edward and Jacob and Summit is salivating at the prospect. Ugh!! I can’t stand it. I can’t even process the reactions if Kris were to win that award with Tayter… I don’t even want to think about that. Especially after the crap she & Rob have pulled the last two years in teasing us. That would just be utter torture!! Yes, it is the horcrux kiss that is nominated for Harry & Hermione which didn’t make any sense to me either. But, I suppose it makes the same amount of sense as does the Puppy/Bella kiss in there. Yes, Rob’s nominated line is, “Doesn’t he own a shirt?” which just makes me freaking ecstatic. That has to win, hands down, no question. Oh YES!! I would have been perfectly fine with Rob leaving the jacket backstage and doing the interview in just that glorious combination!! YUMMY! Marielle~ Aww, sorry about the bump. I’m sure you’ll be in tiptop form by the time your evening fun rolls around. I’m thinking we won’t get much in the way of details. But, we are rapidly approaching the time of the trailer and “official sneak peeks”. The nominations for MTV being released reminded me of just how fast that’s approaching. But, I wouldn’t be too concerned about a Rob-drought. He’ll be doing all the WfE promotions starting mid-April and it looks like continuing into the beginning of May, and then Cosmopolis starts shooting I think at the end of May, though he’ll likely have to be in Toronto for preproduction fairly early. Poor man needs a bit of a nap! The only thing I’ve heard about Akira (those of you who watched MTV 1, this might be the “comic book adaptation” he almost revealed) is that Leonardo DiCaprio is supposedly involved in the production of it. Can you imagine! It’s a Japanimation series, but I don’t know the plot or story. Yes, I saw the ACM announcement. I’m kind of torn about that. I just get one of those feelings where you just feel like it doesn’t fit, you know? Knowing the level of the guitar players who will be present, though, I’m sure Rob will be in heaven. Jaclyn~ I’m soooo glad you liked WfE!! It is such an amazing story and isn’t it amazing (and hysterical in some cases) to read it with RobKowski in your head!! There were moments when I literally rolled laughing at the idea of RobKowski doing that… like the trip to Barabara’s tent!! well here i am again for a real quickie. tracy, i know, every time i nurse him i'm so nervous--i'm on pins and needles waiting for a bite! please by nice baby! anyway, your trip sounds so great. i can't wait to do stuff like that when babyboy (and hopefully his siblings) are a bit older. chrissy, you sound miserably sick, and i'm so sorry for that. i really hope it passes soon. marielle, sorry about your cut! i'm glad you have fun plans tonight though, enjoy! caryn, so glad to have you back on a normal schedule and i hope you feel better soon too. jaclyn, yay for WfE! i was very sad about that part too. it was a great book though and i definitely thought about it for a bit afterwards. i can't wait to see the movie! susie, good to hear from you and i hope you're enjoying yourself! ok, i'm off to start my day, toodle-oo! I always get a little nervous when I comment on a new thread *knees shaking*. I have never been here before so I don't know if it is one of those where you have to be invited. I really like the idea of everyone just saying hi to eachother and just talking about everyday life. So, here is what's going on with my life. I just got the packet to enroll my oldest son in kindergarden this August yesterday. I can't believe that he will be five in a few months. Chrissy and Jazz Girl So sorry to hear that your guys' cough has irritated you asthma after it has been dorment for so long. That nasty cough has been going around for months now. Tracy I saw the nominations on the voting website. I'm typing this at work, so I haven't had a chance to really go through it and check it out. I really hope that the *Edward and Bella* kiss wins, but I have a suspicion that it will be Jacob and Bella. Lulu Congrats on your baby's first tooth. What a milestone that is. I hope your baby is feeling well too. Anyway's back to work. Have a great Wednesday to you all. Or should I say.. Happy Hump Day! Oh, and it is 17C here today!! Mental, especially when it was snowing less than 2 weeks ago. It's a bit cloudy though, but when the sun comes out, you can feel it. It's really nice & warm. I smell spring! LOL. WfE movie - The place of the UK premiere has been announced (Susie it is in the cinema we saw Eclipse in last year! ), and I was reading the article that came with the announcement and the movie is getting released a couple of days earlier than originally thought!! So it's out on Wed 04 May, rather than the Friday! I hope it is also released earlier up here at my cinema...fingers crossed! Caryn - Yay for getting back into a regular posting! I like how usually you have posted by the time I get home from work LOL. Haha, yep I defo am intrigued to see how Rob plays Jacob It was cool to "see" the story picturing Rob as Jacob, but not once did I think of him as "Edward" and I am glad, as I was worried that might happen LOL. I gave my bf a rather long recap of the entire story last night after I finished the book... So he prolly knows as much about it as the rest of us now LOL (I remember when I first read the Saga I done the same then too Haha!). VolturiGirl - Hey there! Of course you are welcome to join us, we like new people The only thing I would say you had to do was be a fan of Rob Pattinson as we talk about him an awfully lot LOL. I'm Jaclyn from Scotland. Do you go by your real name here, or would you prefer to be called VolturiGirl? Yep we talk about our lives a lot here; it's really great here - all the ladies are so nice & polite & wonderful really!! You will have a great time! So you have a couple kids then? How old are your other ones? I'm sure he will have a great time in kindergarden! A little welcome gift for ya! Susie's whereabouts - Right lets start the guessing game LOL! I know that Tracy wonders like me what she is up to. So here is my theory I think she is on her way to visit Lulu, but maybe not straight away...maybe she will wait until her own spring break next week?? Or maybe she is on her way but is stopping somewhere else first?? But...the fact that she didn't mention where she is with SonnyBoy suggests it is defo a HH World Tour destination. Maybe Desiree?? Cmon Susie, you need to tell us!! LOL!! Well I'm going off now to do a couple things before we leave for the pub. Enjoy your evening everyone! VolturiGirl~ Welcome to the HalfwayHouse, where we don't cure the addiction, we feed it. We're a pretty welcoming bunch. We don't require an invitation, just climb through the window anytime you please. As Jaclyn said, we do share one trait here in the HalfwayHouse. We share an unabashed additction for a certain beautiful British man named Robert Pattinson. The Saga may have put him out there, but we've snapped him up as our very own. So, welcome. I hope you like our happy little corner of the Lex. NEW WfE Stills~ Just happened across the following beauty... behind the scenes stills from WfE. Yummy!! I'm so going to love watching the speakeasy scene. Rob looks so dapper and Reese looks gorgeous and we get to see Rob dance!! Awwww, RobKowski and Queenie. I swear this man just makes my heart warm and fuzzy. Hmmm, I'm betting I know what this scene is. Look at RobKowski, ever the gentleman. No lady of his will ever carry her own burden. Oh. My. Lawd. The thoughts this picture inspires in me would likely get me arrested in several states. Join me in the gutter, won't you? Jazz Girl and openfire: Thanks for the welcome and for feeding my addiction, which I am proud to say that I have.